Easy to find, Creetown is directly off the A75 Dumfries to Stranraer road, approximately five miles east of Newton Stewart. The town is approached on a “D” road which runs through the centre of the village, St John Street. 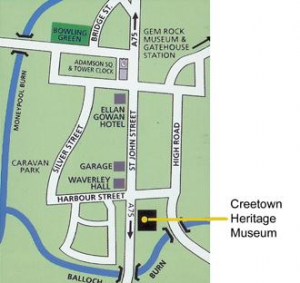 The Creetown Heritage Museum is situated at the south end of St John St. Car Parking is permitted on the main street directly in front of the museum.